Photo courtesy Karen Philhower of Safe Hounds Beagle Rescue and adorable fosters Seamus and Josh. For the past several days, we've been baking in the early summerlike heat here in the northeast, with high humidity and temps in the 90s. As we crank up the a/c, it seems like the ideal time to issue some common sense reminders on precautions to take in extreme heat for the welfare and safety of our 4-legged friends. - Dogs in the car: Fine for "touring" with windows open or the a/c on; but don't do it to run errands and leave your dog in the car: We could say this one until we're blue in the face, and yet we still pass parked cars with windows cracked on the hottest of days. It is cruel and inhumane. We don't need to quote stats, do we? Your car becomes a pressure cooker, with the heat rising exponentially in an enclosed space. If you need to run an errand, even for 5 minutes, leave your dog at home. - Exercise caution: Scale back the duration of walks and outdoor play time, and don't exercise during the hottest part of the day. Just as you would tend to do your own exercise during the cooler morning or evening hours, layoff too much exertion when the temperature soars. Don't forget to bring plenty of water and periodically seek shade and rest. - Hydrate, hydrate, hydrate: Encourage your dog to continue to drink when you're out of doors. If he's not inclined to take a sip, toss a biscuit in the water to make him lap up some H2O while he finds his way to the treat. - Watch sensitive paw pads: When the asphalt heats up, it can burn the skin. Be mindful of the surface temperature of the area where you're walking. - In the swim: While Beagles as a rule aren't known for their love of water, there are some that do enjoy it. If your dog is a swimmer, never leave him unsupervised, teach him how to safely find the steps to get out of the pool, and make sure he's well hosed down afterward to remove chlorine from his skin and coat. - Respect your elders: Remember that as dogs age, they may become more sensitive/less tolerant of the effects of extreme heat. - Cool products: Some ideas to keep your dog cool: Doggles, bandanas w/microbeads, Canine Cooler beds. 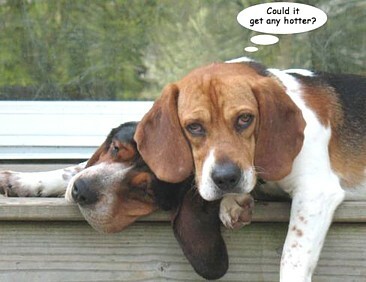 - Heat exhaustion: If you suspect your dog has had too much heat, take action immediately. Seek shade and check for signs of dehydration: Check the gums to see if they're pale, listen for shallow breathing, and cool him down. Contrary to popular practice, do NOT pour water over his head! That will only seal in skin oils and make the situation worse. The place to apply a cool compress is inside the groin area, where the femoral artery passes. And, if he is losing consciousness or you see pale gums or signs of labored breathing, this is a medical emergency that requires immediate vet care. Summer activities can be fun, and that includes time spent outdoors with your dog. With a little care and planning, the only hot dogs you'll have will be the ones on the barbeque grill.